What are the shopping/behavioral/spending/channel habits of my customers? The Analytics to tackle the issue are pretty simple conceptually. Yet, it is easy to get lost between all the techniques available. Let's make a rundown on what's out there. ex:Clara Clara is a sister version of k-means that creates medoids instead of clusters. The main difference is that Clara returns centers that are actual individuals Used for large datasets that still fits in memory. 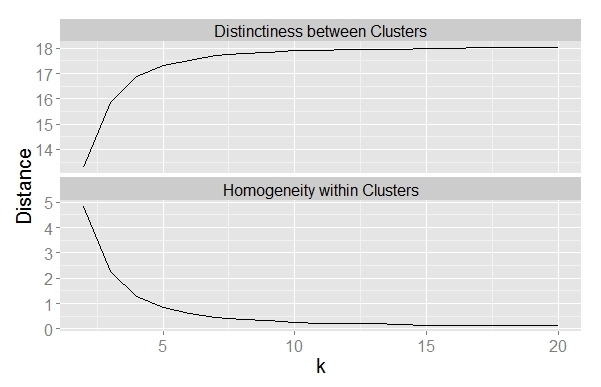 ex:Fanny Similar to K-means but allows each point to be a member of several clusters Rare. Hierarchical Hierarchical Clustering Has 2 flavors: Top-down and Bottom-up. For Bottom Up: Aggregate each point with the closest one until there remains only 1 group. Let's use the following (bogus) problem statement: We would like to design a county-level experiment to understand the effect of an implementation of a public policy on races (for instance, the very controversial No Child Left Behind policy) with the objective to be fair to everyone. 1- How many different segments of counties are there? 2- What are their characteristics? Those 2 curves show that k between 5 and 10 are good picks and achieved most of the optimal performance. I usually use this curve to select a range and then create 2-3 scenarios and see what the client feels the most comfortable with (How much is worth more granularity? Are the size of the Clusters ideal and uniform enough for your campaigns...). Depending on the use, we may choose different k). For the sake of the argument, let's go with 6. K-Means is a rigid algorithm: Once the number of clusters has been determined, it is difficult to go back. In addition, we see that they are some cases on the cluster frontier that the algorithm took the decision to put one single cluster (i.e. no sense of partial classes). To remedy this situation, we can use a Hierarchical Clustering (only for small populations as it is expensive to compute). 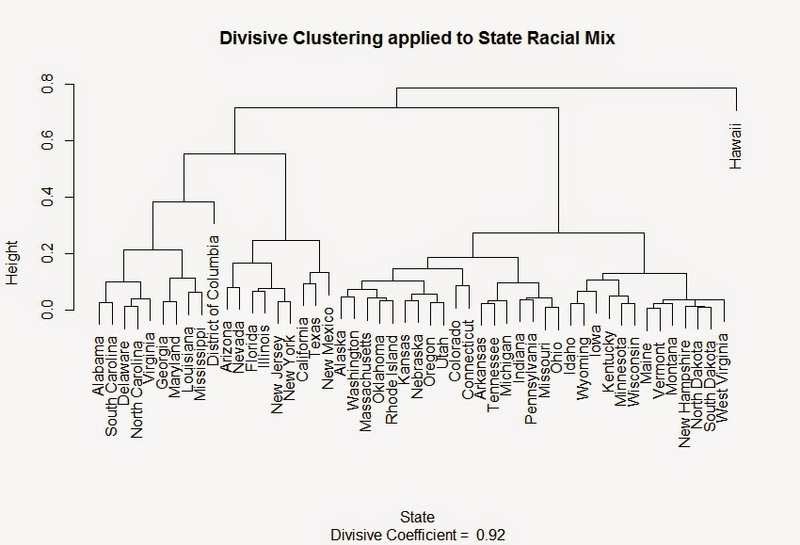 In our case, we want to understand how close States are in terms of racial mix. That being said, we can choose to prune (i.e. cut) at the height we want, giving that extra-flexibility that K-Means did not allow.